« Birds and dinosaurs, collagen, and Huxley. Apparently shedding light on Darwin (for photography) is difficult. Incidentally, this statue of Darwin is located next to a small cafe at the back end of the first floor at the Natural History Museum in London. 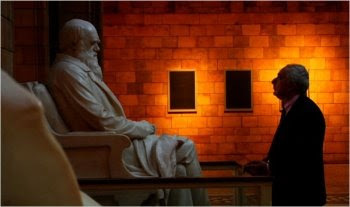 In the main hall, halfway up the central staircase and overlooking the reconstruction of Dippy (Diplodocus carnegii), is a bronze statue of Richard Owen. 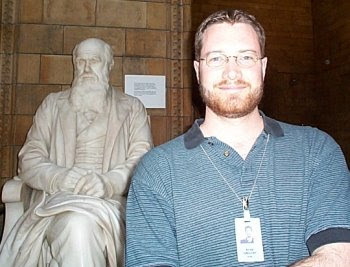 It seems the Natural History Museum forgot to expel this vocal opponent of “Darwinism”. I suppose the fact that he did real research and founded a real museum (namely, the NHM) had something to do with it. A pronounced affection for parasites. 2 comments to Shedding light on Darwin. I work at NHM and it really irks me that Darwin is down in the cafe by the dirty dishes while Owen takes all the glory at the top of the stairs in the central hall. I have some good news courtesy my insider knowledge, though: there are moves afoot to rectify this statue scandal in 2009!! Even though Owen was a creationist, he did found our museum on the concept that everyone should be allowed to see natural treasures not just experts, and he also coined the word “dinosaur”, for which reasons I think his statue should be in a place of prominence… just not that place.